It’s Women’s Day, and one by one women’s groups take the stage to present their song or skit. A crowd of people sit close together under a large, striped tent, listening to the messages of female worth and dignity. The performers are members of Self Help and Savings groups run by field India-partner CHETNA, a community development project operated by the Emmanuel Hospital Association. Among their audience are several mukhyas (village mayors) specially invited by CHETNA. The people watch and listen, growing increasingly lethargic under the stifling summer heat. Some people drift off; others join the crowd late. Several of the mukhyas become restless, eager to go home. That’s when Gayatri Devi’s group takes the stage. Their skit tells the story of a woman destined to die voiceless and forgotten. She could be any one of them. A woman who only ever studied to first grade, reliant on a husband unwilling to provide for their family. A woman who watches her children fall asleep hungry night after night. A woman who takes a job at a local government school, cooking the daily rations provided to poor students, which allows her to take home a small amount of rice to keep her family from starving. The crowd grows quiet. They watch as the woman collects leftover coals from her cooking to sell at market. They watch her use those few coins to buy vegetables to go with the rice for her children. Then this desperate woman meets CHETNA staff and they explain the benefits of getting an education. CHETNA empowers community groups like Village Health Committees and Women’s Self-Help Groups to act on behalf of themselves and their communities for better education, sanitation, health, and greater economic opportunities. She joins a self-help group and begins studying late at night, after the day’s work. She completes enough education to apply for a government job with a salary that will provide for her family. The mukhyas in the crowd sit up when the woman goes to her village mukhya, the man responsible for recommending villagers for desperately needed government jobs. The mukhya agrees the woman has the qualifications for the job. What she does not have, however, is the money he wants for the privilege of recommending her name. Four times she returns to the mukhya; four times he turns her down. Gayatri’s group closes their skit with a song they have written, a lament over corruption – a cry for justice. Many in the crowd, including several mukhyas, weep openly. Only one person in the audience realizes that this is not fiction, but the life story of Gayatri Devi. The mukhya from her village has just seen his own actions portrayed on stage. Many of the mukhyas are enthusiastic about the message of empowerment and justice they have seen and heard and invite Gayatri’s group to perform the skit in their own village. Because of the performance’s impact, CHETNA receives many invitations to start new self-help groups. And Gayatri’s courage in telling her story results in her mukhya recommending her for the job. That might’ve been the happy ending into which Gayatri could’ve settled. A good government job, her children’s thin bodies filling out with nutritious food she can now afford, their education moving forward in a better school. But one day, a woman came to Gayatri’s home. She was better dressed than the usual visitor and a surprised Gayatri recognized the wife of the village mukhya on her doorstep. As they drank tea together, the mukhya’s wife explained that her husband’s term as village mayor was nearly up. She was considering standing for election against him. Would Gayatri, she wanted to know, mobilize her group to help her get elected? Gayatri gathered her group and they questioned the mukhya’s wife about her intentions. When they were satisfied that she would stand honestly for women’s rights and the betterment of the village, they campaigned for her – parading through town with signs and slogans, going door-to-door, encouraging women to support her. She won the election easily. 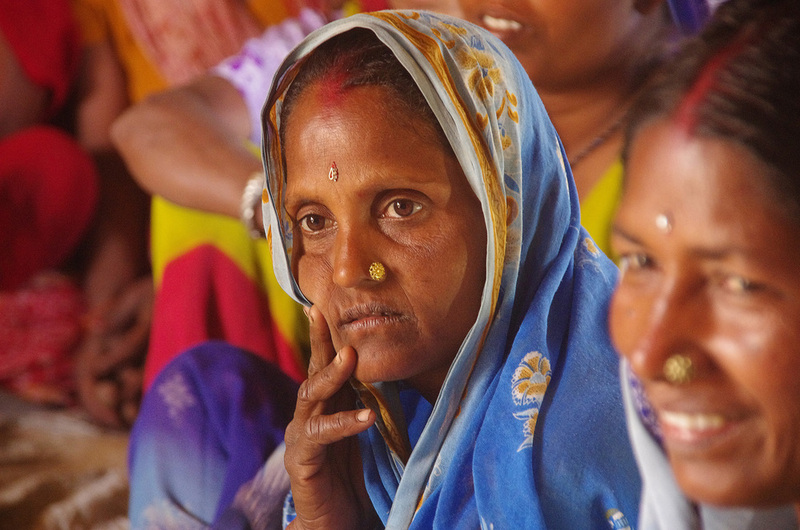 Hearing of the power of Gayatri’s group, other mukhya-hopefuls began coming to her for support. She questioned each one about their intentions regarding women’s rights and justice for the poor. If she was satisfied with their answers, their group mobilized to campaign for the candidate. Each candidate they’ve supported thus far has won. Gayatri’s group doesn’t only help get people elected – they keep an eye on those officials once they’re in office. Gayatri recently received word that the first mukhya who sought her help was going back on some of her promises. The group marched to her office to remind her – we got you elected and we can get you unelected. Now the mukhya is re-committed to protecting and empowering women and the poor. That’s the effect of a woman once doomed to die voiceless and forgotten, now empowered by education and supported by CHETNA. A voice louder, a strength more tenacious then anyone quite expected.